I love the radio. It’s my equivalent of a shed at the bottom of the garden. It’s the place I go to for four hours a day to get away from the real world and enter my imaginary one. It’s my playtime and everybody’s welcome to join in. I present Drive on Brighton’s Juice 107.2 3-7pm Monday to Friday. Highlights of the show over the last few years include giving an emotionally unbalanced parrot reiki on the show (and Zoe and Norm texting in saying they loved it) and getting Chris Eubank to fight the whole of Skegness, after it had a go at Brighton. This is how I roll. Have a listen to my best bits or listen to the show live, where my best bits are sporadic at best. 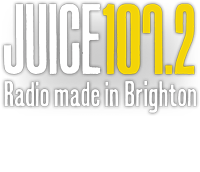 You can listen to Guy Lloyd on Juice Drive between 3-7pm on Brighton’s Juice 107.2.